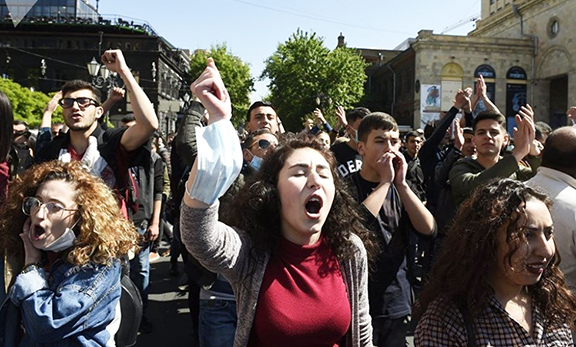 YEREVAN (RFE/RL)—Senior Armenian officials declined to clarify on Monday when President Serzh Sarkisian could act on his renewed threats to effectively invalidate Armenia’s 2009 normalization agreements with Turkey. Parliament speaker Galust Sahakian also would not be drawn on the subject, saying that it is up to Sarkisian to decide the future of the protocols. “I think that you should not ask me this question,” he said. Ankara has repeatedly made clear that the Turkish parliament will not ratify the protocols until a resolution of the Nagorno-Karabakh conflict acceptable to Azerbaijan. Yerevan rejects this precondition. Sarkisian has threatened to withdraw Armenia’s signature from the protocols on at least three occasions in the past. The Turkish government has not reacted to his latest threats. Only the king sarkisyan knows, all others are irrelevant , welcome to democracy a-la- Armenian style. PULL OUT,QUIT STALLING,PLAYING GAMES..The jerky turks are LIARS,CANT BE TRUSTED..
As a Statesman 3 bluffs is far too many. Pursue an Armenia only agends! Hay what are you waiting for .More humiliation ?. I don’t know how they are going to use this flexibility. The Armenian people have already buried the Hellery Clinton’s so called Turkish-Armenian protocals. Serz Sarkissian can not open the dead’s coffin if he and Nalbandian were to be bribed again by Hellery’s alikes. No more speculations on ifs and yeses. Do you Kapish! It is dead and finished and the dead protocal has already rotten and gone. Even God can not revive it. Go and play your dirty games on someone else’s backyard. After the cowardly attack on Der Zor, the Armenians know very well who is who. The friends of Genocidal Turkey are not our friends. So, everyone out there do not bug in. Go and fly your kites and get the hell out of our business. Bravo President Sarkissian, he’s acting very smartly. whenever tsar Putin tells him what to do. Armenia does not have it’s pro-armenian foreign policy.